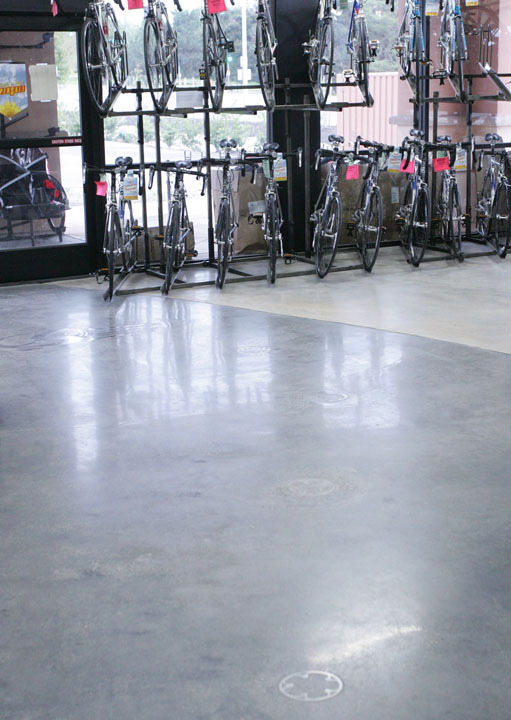 If you are looking for a floor finish that is low-maintenance, holds up to heavy traffic and can make your showroom or business sparkle, then Bomanite Custom Polishing Systems is the floor finishing option for you. You can pay (and keep paying) for a floor finish that requires frequent repairs, reinstallations and costly upkeep, but why? 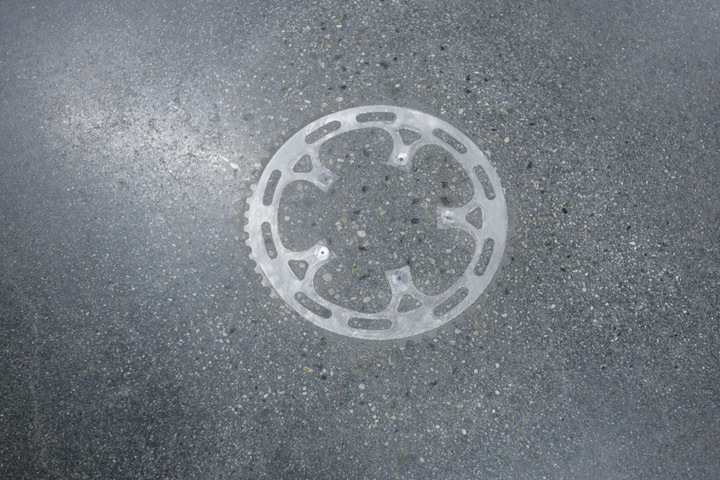 Available in finishes from satin to gloss, Bomanite Custom Polishing Systems offer exceptional resistance to slipping, abrasion and impact, not to mention look great, are environmentally friendly and easy to clean! 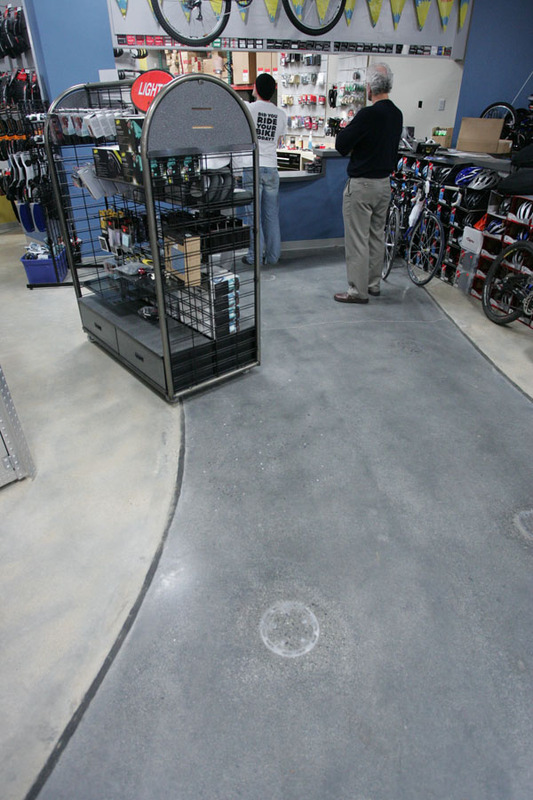 With help from their local Bomanite Licensed Contractor Heritage Bomanite, located in California’s Central Valley, Tri- Sport Bicycle of Fresno updated their merchandise display area with polished concrete floors. 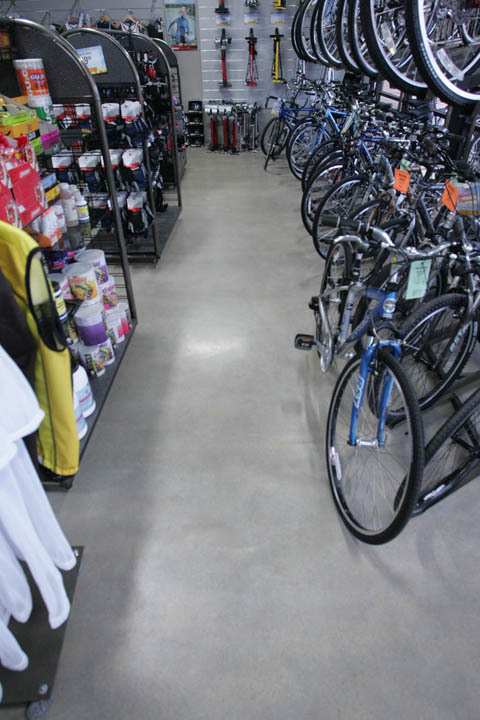 Looking to combat wear and tear to add service life to their floor, reduce costly maintenance and create a custom designed surface to set their showroom apart, Tri-Sport found Bomanite Custom Polishing Systems to be the answer. Working with designer Suzanne Byrnes of Facility Designs, Heritage Bomanite was able to create a custom floor finish to meet Tri-Sport’s design expectations. Utilizing Renaissance by Bomanite™, a system from the Bomanite Custom Polishing collection that provides a lustrous finish with Bomanite’s premium Integral Color blends, the Heritage team set out to accomplish the task at hand. First, the Heritage team poured Black Bomanite Integral Color next to the gray concrete to create a flowing design throughout the store. 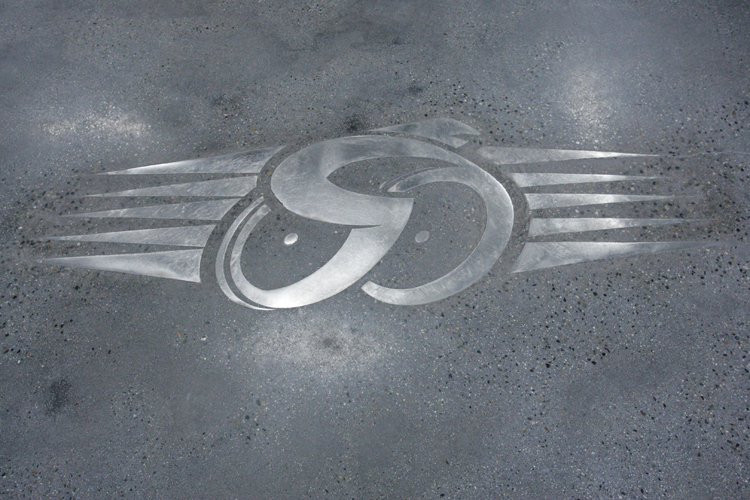 A custom stainless steel logo was then made and set into the freshly poured concrete near the entry door. 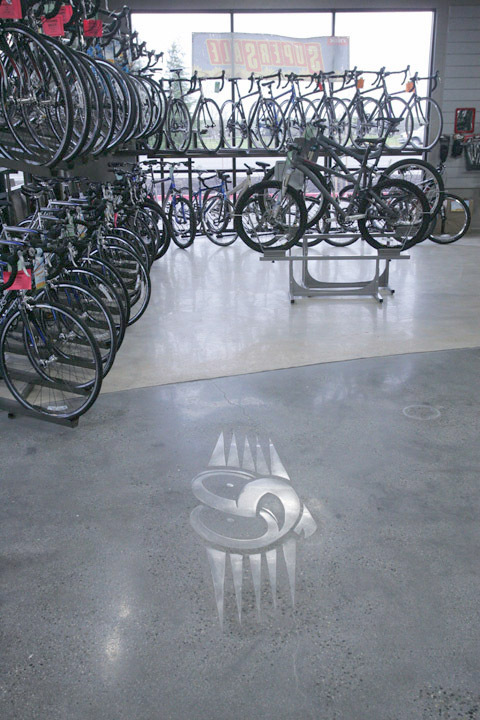 The Heritage crew then placed bicycle chain rings in the concrete throughout the store and sprinkled colored glass in various areas to create a distinctive decorative effect. 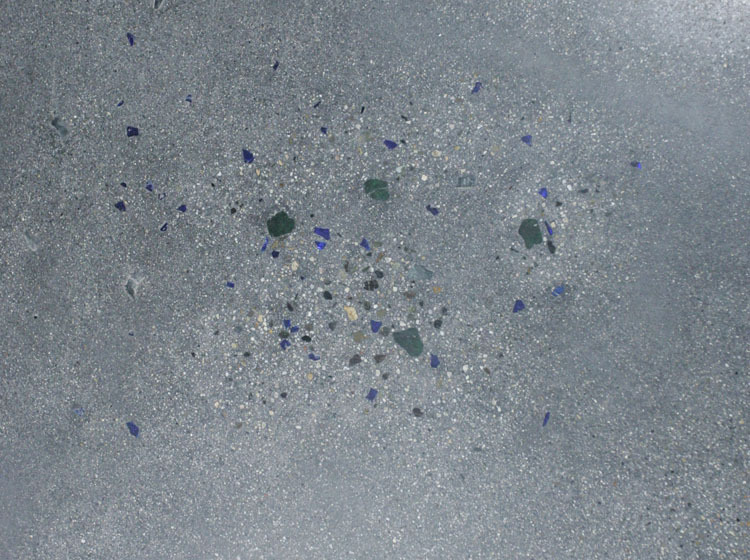 Once the concrete was cured, the team polished the concrete to 3000 grit, exposing the metal and glass elements. Bomanite StainGuard was then applied after the polishing was complete. Utilizing the in-depth skill, equipment and concrete artistry of Heritage Bomanite’s craftsmen, Tri-Sport was able to create a retail display space that is not only durable and easy to maintain, but is unique and bright that accents their merchandise and apparel.